PamMichele: DRAKE & NICKI MINAJ WED (tweets included)! 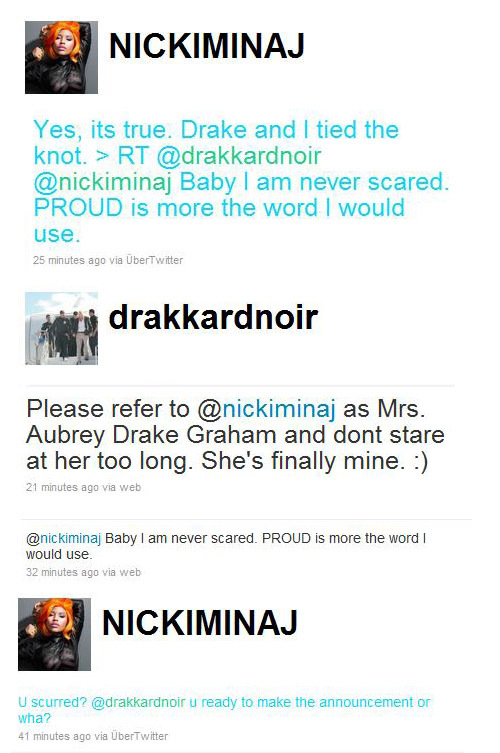 Now, I'm not sure if this is 100 percent true, but less than an hour before the time of this post, Drake and Nicki Minaj tweeted each other back-and-forth about the said marriage. If so, CONGRATULATIONS! I couldn't think of a pair more suited for each other than these two. ...I want to see pictures, though, and a marriage license because this sounds too good to be true. UPDATE! : It seems as though the tweets were too good to be true. Nicki Minaj tweeted this nearly 24 hours after her and Drake's "important" announcement: Dear Barbz, My husband Drake and I have decided to have our marriage annulled. We'll maintain joint custody. Luv, HB. Maybe this was a stunt to promote her debut album, and if so, she had the whole world buzzing. Good job, Nicki.